A doctor of pharmacy degree (Pharm.D) prepares students to become pharmacy practitioners in a wide variety of settings, including community and retail pharmacies, hospitals, managed care facilities and many more. KU School of Pharmacy offers graduate degrees in Medicinal Chemistry, Neuroscience, Pharmacology & Toxicology, and Pharmaceutical Chemistry and residencies in Pharmacy Practice. 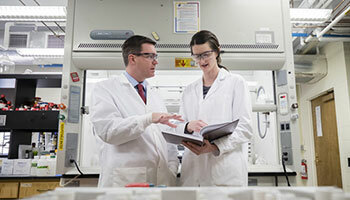 The KU School of Pharmacy is fourth in the nation in National Instutes of Health (NIH) funding.